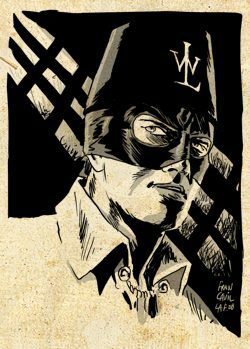 As for the Shadow, the Green Hornet has been around since the '30s and it has been adapted in many media: radio show, movies, tv series, and novels and comics. Created by Fran Striker, the Green Hornet tells the war against the crime conducted by this vigilante who is often helped by his (expert in martial arts) Asian manservant Kato. The man behind the mask is Britt Reid, a newspaper publisher by day, who uses his investigative reports to hunt down the criminals in the city with also the help of some cool gadgets and the technological equipped car (ala Batman!) known as Black Beauty. 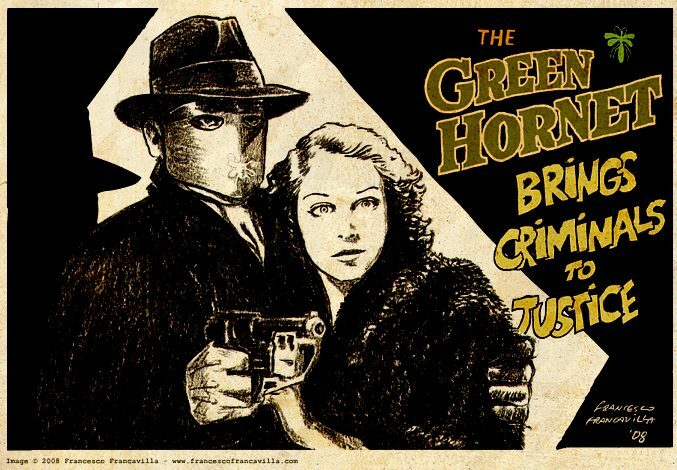 The mask on his face has changed thorough the years (from covering just his lower face as a bandit, to the upper face to a full face mask) but the symbol of the green hornet has been always there to testify that this is indeed a hornet that stings! In his TV series version, the Green Hornet is famous to have Bruce Lee in the role of Kato. Even if the series was up just for one season, it is still remembered nowadays for Lee's performance (the show was actually re-titled "the Kato show" for the Asian market). Have a Pulp Sunday, everyone! Pulp Spotlight is the new monthly feature where I will cover other famous characters that have helped to build the Pulp genre not just on the radio but also in the other media. 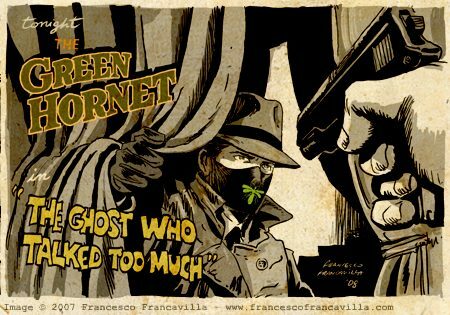 Another ghost story for this week, but with a different hero coming to save the day of the unlucky victims: the Green Hornet! We will get to the Green Hornet profile when he gets the spotlight feature, but for now let's enjoy the episode assuming you all are familiar with this other icon of the pulp genre. Enjoy the episode of "Il Calabrone Verde" and have a Pulp Sunday! 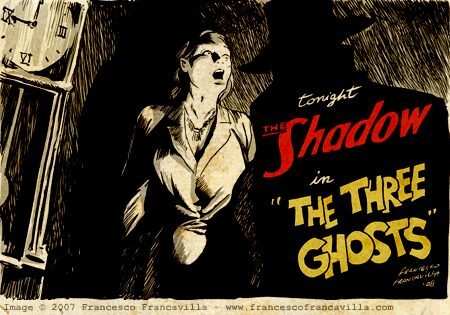 Even if this episode was aired on Halloween and starts in what seems to be a haunted house, we will soon discover that (as usually happens in the Scooby-doo cartoons ;)) there is a perfectly logic explanation behind the supernatural phenomena happening in the mansion. A woman is brought to madness by the newly married husband, a "professor" who turns out to be a crook just released from jail. The guy works with 2 "partners" who play the black widow card as well. 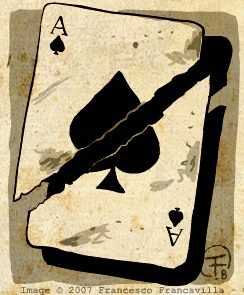 Speaking of card, it's interesting to see how The Shadow plays the terror card, literally, by throwing a half ace of spade to the professor menacing next time he will give him the other half as sign of his death sentence. the Shadow also use his hypnotic powers to have to professor kill one of his own partners. Enjoy the episode and have a Pulp Sunday! 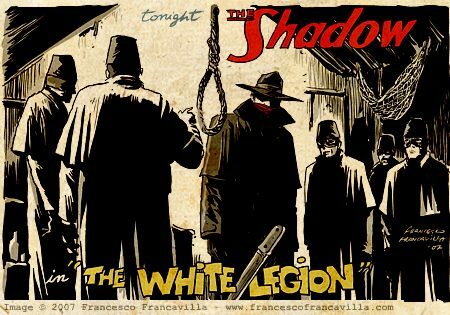 A "shadowy" group of masked men who call themselves The White Legion - Avengers of Injustice - are kidnapping and executing by hanging (after some sort of trial) key witnesses in an upcoming high profile court case against a famous gangster. Somehow the press is not covering the activities of The White Legion which makes Lamont suspicious about the whole situation (as he witnesses, first hand, the kidnapping of the assistant D.A.). I liked the idea of this masked organization, and even if the name reminds a bit of the well known triple K, the description of the outfit and the purposes of the White Legion in the episode made me thing more to some kind of Masonic organization, so I came up with the design for the guys that you can appreciate in more details (including personalized logo ;)) on the left.